When I was younger, my mom would, from time to time, call me into the kitchen for my Korean cooking lessons. . she had a notepad ready with a pen so I could meticulously take notes and write everything down and hoped I would ask a lot of questions. I was young and stupid and couldn’t be bothered with these Korean cooking lessons. I was such an idiot. I rarely took notes and barely wrote anything down. . my awesome mom still pressed on and I think we had a total of 5 or 6 lessons before we mutually decided to stop. I so wish cooking Korean food was interesting to me back then. . but I’m sure all I was thinking about was watching TV or boys. . or something trivial and stupid like that. When I moved out of Texas (for the first time in my life) to San Francisco, CA to live on my own. . my mom packed 5 or 6 Korean cookbooks for me . . hoping. . praying I would pull those suckers out and put them to use. Those cookbooks did one thing in my small, quaint, less than 1,000 square feet studio apartment in the Marina: collect dust. 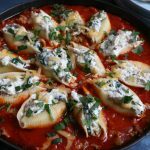 I think my mom even called and asked me a few times, “Have you tried any Korean recipes?” “Are you cooking for yourself?” What are you eating anyway?” “Are you going out to eat every night?” Now, that I have daughters, I finally understand why she was so interested in what I was eating. A few years later, I moved to Los Angeles, CA (where I would spend the next 12 years or so) and I think I may have dusted off one of the cookbooks because I attempted to make mul nang myun or bibim nang myun once and it was a complete disaster. You see, these cookbooks were alright I guess but nothing compares to your mom’s Korean cooking. Those priceless lessons and times spent together I could have enjoyed and cherished were over. . I live in Washington now with my own family and she’s in Dallas, TX. I do, however, ask for impromptu lessons over the phone all the time and whenever we see each other now, I always ask her to teach me something. For those of you that are still able to learn from your grandmothers, mothers or fathers. . take advantage of the time. Write down those recipes. 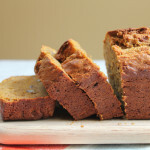 Make them for your children and pass the recipes on. I love that Korean food has become more well known with Korean BBQ and has gained more awareness and popularity. There’s so much more once you get past the beef short ribs. 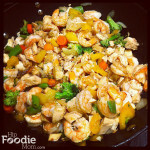 . . Soups (like you wouldn’t believe), noodle dishes, seafood, chicken, and so many vegetable dishes it’s crazy! 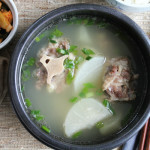 So, because I want to encourage others (who might have not ever tried Korean food- or for those who love it but have never attempted to make something at home) to cook Korean, let’s spend some time (and a few posts over the next few months) Celebrating both Traditional and Innovative Korean Food! For starters, if you like spicy, you’re set. Korean food is all about bold flavor, spicy and making you sweat. If you have never tried kimchee, you need to. Please go find the closest Korean grocery store (or, go to Costco. They sell it there and it’s not bad) and try some. There is even water Kimchee (mul kimchee) which is watered down more and not as spicy. . so if you want to start out slow, maybe go for this one first. Kimchee (or Kimchi) is cabbage fermented with garlic, sea salt, red chili flakes, ginger, vinegar and a variety of other things. 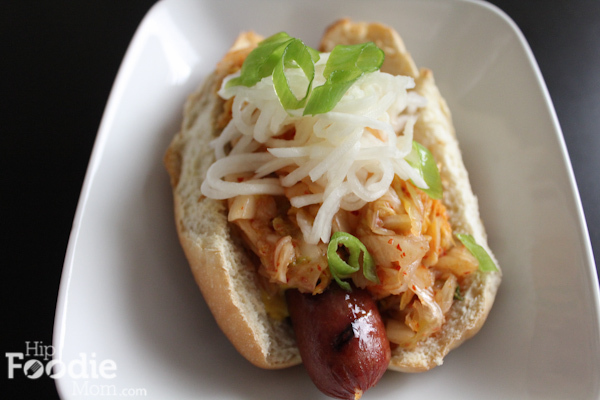 I’m loving all the new and innovative ways people are enjoying kimchee now. . 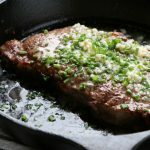 I just saw a recipe for kimchee butter on steak (yum!) and now this. . . 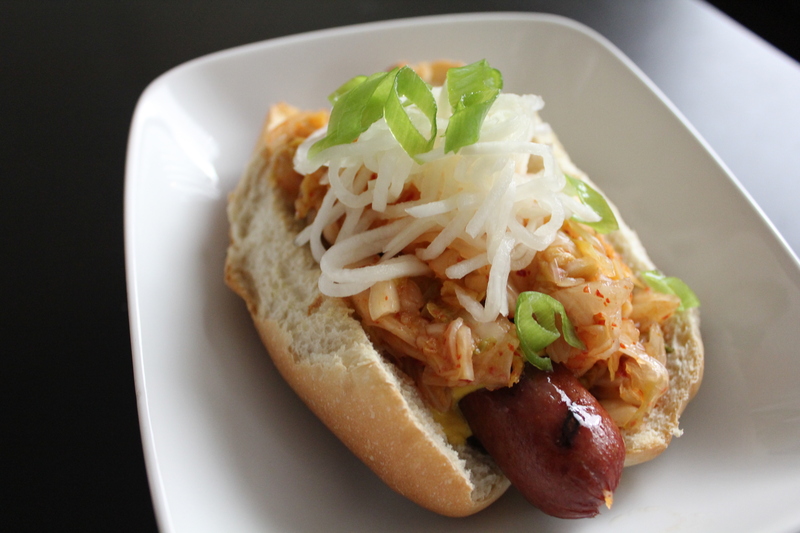 I realize I’m a little late in pairing kimchee and hot dogs together. . but hey, better late than never right? And I’m thinking Kimchee Grilled Cheese . . Kimchee Mac n Cheese. . hell, maybe we should try Kimchee ice cream? The possibilities are endless! If making the white radish banchan, please note the cook time. 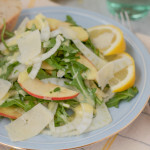 Using a julienne, cut the radish into long strips (match sticks) and set aside. Mix together 2 cups water, 1 cup of the brown rice vinegar and a 1/2 cup of the sugar and pour over the cut radish. Mix and let sit in a bowl for at least 30 minutes. 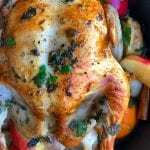 Taste and add more vinegar or sugar accordingly. Boil some water and cook the hot dogs for about 5-6 minutes. Preheat a grill to high or a grill pan over medium-high heat. In a small bowl, mix together the kimchi, honey, and vinegar. Place the hot dogs on the grill and grill until browned, crispy and you can see those glorious grill marks. Place rolls on the grill and toast until golden (or you can use a toaster oven). 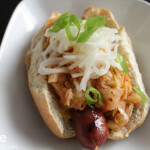 Place hot dogs in rolls and top each with the mustard, the kimchi mixture, top with the radish banchan* and garnish with the diced green onions. Serve immediately. Recipe adapted from The Kimchi Chronicles, the cookbook. Thank you! It WAS amazing!! If you like kimchee, you must try this! 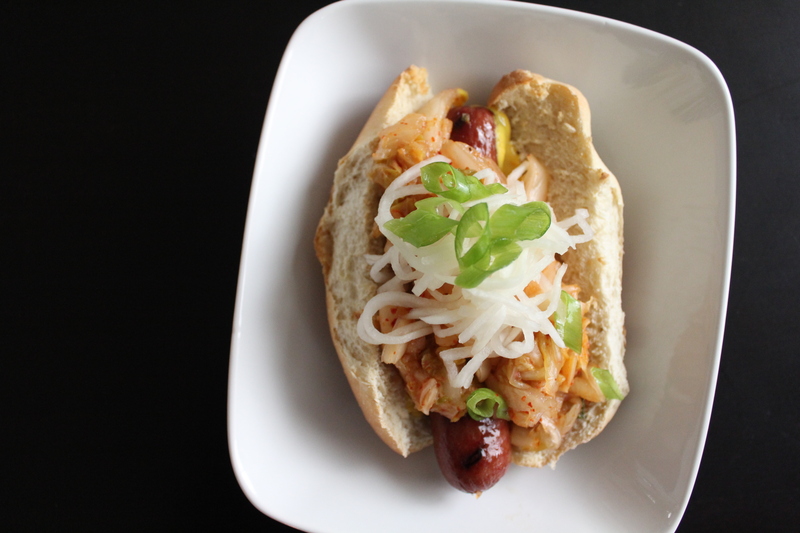 Kimchi hot-dogs 네 oh yum! ㅋㅋㅋ! 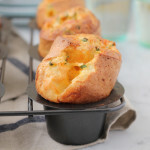 I’m making these for the family tomorrow. I’m sure they can’t wait, especially my husband. Thanks! 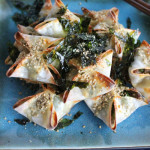 Kimchi turns anything into… food. I don’t think ice-cream though. Hooray!!!! Thank you so much! Hope you had a fabulous Labor Day!